We move to a brighter topic with word that the much ballyhooed Lilly Pulitzer Home Collection is now available for ordering through Neiman Marcus. To be clear, shoppers won’t find the entire 200+ piece collection at Neimans. But there is an interesting selection that provides a look at many styles as well as giving a sense of pricing for the line. Below, several items qualifying as Pretty in Pink, the Boulevard Armchair, Aster Mirror and Mizner Bench. Bright and sunny, the Boulevard and Breakers Barstools. The Carrie Loveseat is seen below left, and on the right, the Paramount Daybed. And pieces from the Classic White Dining Furniture group, note the lining inside the drawer. A significant component in the new collection is the Lee Jofa fabric line that is just launching. Lonny Magazine shares some fabulous photos of the vibrant textiles here in their blog, we show just a few of those images below. Also today, we have seen some very serious tiaras the last few days, as the President and Mrs. Obama continue their official visit to Britain. At Tuesday night’s state dinner at Buckingham Palace we see both Camilla Parker Bowles and Queen Elizabeth in glittering headwear. 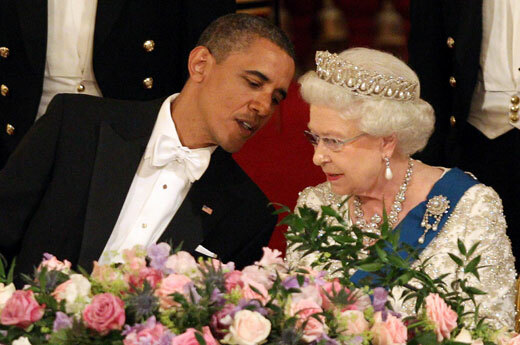 The Queen wore the Lovers Knot Tiara. Mrs. Obama was elegant in Tom Ford for that event, the ruched silk georgette gown had a darling bow at the waist. Politically it was a wise choice, Mr. Ford shows his collections at NY Fashion Week but has his offices in London. The designer recently re-launched his women’s line, this is a big boost for his work. Last night it was our turn to host the party, for that event the First Lady opted for an American fashion house, wearing Ralph Lauren and she looked simply beautiful. Mrs. Obama chose striking jewelry from Tom Binns to finish off the look, the designer’s Dumont necklace and cuff nicely accenting the dress as they sparkled brightly. 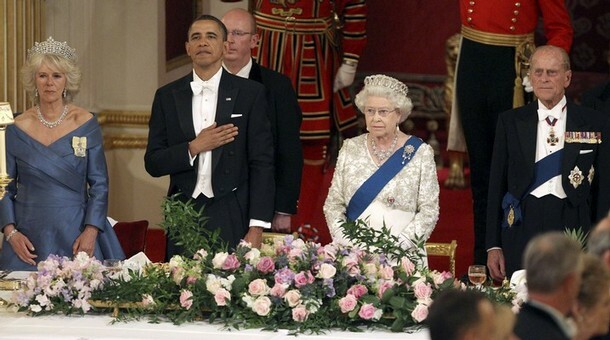 The dinner was at Winfield House, the US Ambassador’s official residence. Originally built and donated to the United States by socialite Barbara Hutton, the house was named after her father, Frank Winfield Woolworth, he founded the stores bearing his name. For more on the building, click here. Dressing for international events as the First Lady is not an easy task, there are sensitivities of both a cultural and political nature to be considered with each and every wardrobe choice. Mrs. Obama made some outstanding choices on the British leg of the couple’s 8-day European trip, although it’s no secret your trusty scribe wasn’t overly fond of the floral Barbara Tfank worn Tuesday when meeting the Duke & Duchess of Cambridge (aka Wills & Kate). 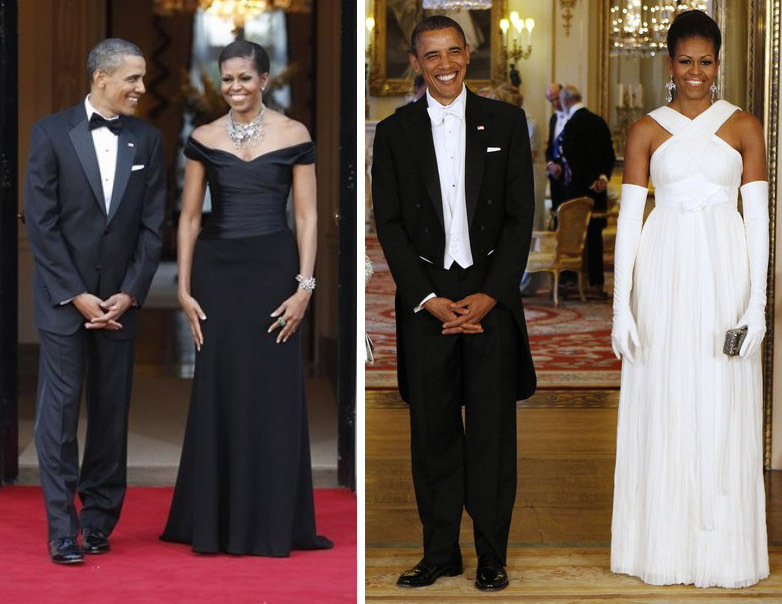 Both formal dresses were lovely on the First Lady, but we really prefer the Ralph Lauren to the Tom Ford. At the risk of incurring the wrath of fashionistas far more sophisticated than I, the Lauren seems a much prettier and more elegant look for the First Lady. 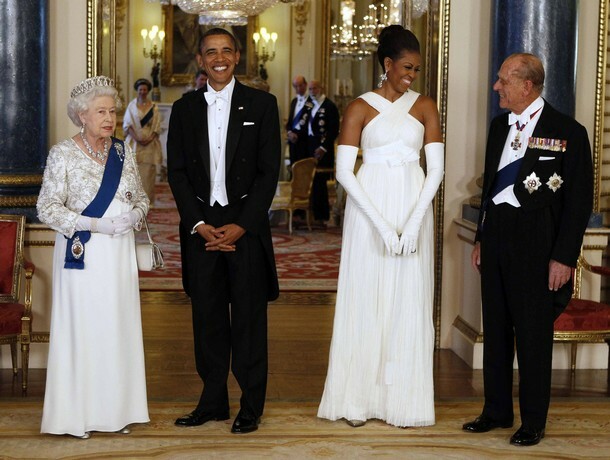 While most fashion writers raved about the Grecian-style Tom Ford, we think the Lauren is more flattering on Mrs. Obama. We leave you with something rather out of the norm for this space, a museum visit by two NBA players. There is nothing profound about the picture, it merely shows Jason Kidd of the Dallas Mavericks and Russell Westbrook from the Oklahoma City Thunder visiting the Oklahoma City National Memorial and Museum earlier this week. The Mavericks were in town for the playoffs and the players visited the museum. It wasn’t the first time Mr. Westbrook had been to the Museum, the Thunder’s head coach, Scott Brooks, has every player that joins the team visit the site. But at a time when so much of professional sports seems broken and the day’s news is difficult to digest, we thought it nice to end on a note about something unremarkable, something simple, something nice. Hello-Hello, what a delightful Wednesday it is here at The Prepatorium, albeit it a little harried. We shift directions today in light of yesterday’s big announcement that Lilly Pulitzer has been sold to Oxford Industries. We have had a few queries on the topic, and thought it best to look at this development rather than engaging in our usual blather and drivel our planned post more relative to seasonal goings-on. 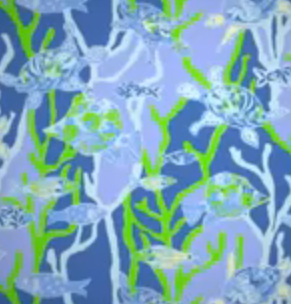 Back to the deal: Oxford was prepared, posting a link on its home page to “a retrospective look at the Lilly Pulitzer brand” via a You Tube video. 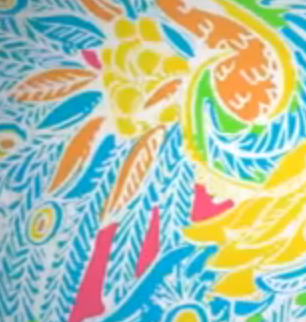 The clip offers a nice look back at Lilly history, including images of patterns and prints, iconic designs and celebrities in Lilly. Oxford also co-hosted a conference call with Lilly’s management team to share details about the sale and what it portends for the future. “In the world of deal-making, prep is still in, and pink is looking awfully pretty. “One month after J. Crew agreed to sell itself to two buyout firms, the parent company of Lilly Pulitzer — the maker of eye-catching dresses for the horsey set — sold itself on Tuesday to Oxford Industries for $60 million in cash. Jean Palmieri’s story in WWD notes Oxford plans to add 4 to 7 new stores a year to the existing 16 corporate stores. This may be good news in many respects, but there is significant anxiety from non-corporate stores, as all Tommy Bahama stores are owned by Oxford. When a company is publicly traded there are different goals. Shareholders have profit expectations, and those expectations must be met. Having worked for both privately held and publicly traded media companies over the years, there *is* a difference. By the same token, Lilly Pulitzer is already engaged in making money, it hasn’t ever been a not-for-profit endeavor. However, an additional $20 million dollars is on the table if Lilly meets certain earnings targets. It doesn’t take an MBA to recognize that amount of money can be a strong motivator in finding ways to meet such goals. The current management team will remain at the Pink Palace. Scott Beaumont and Jim Bradbeer, (CEO & President, respectively) brought the brand back from the grave and have demonstrated they know their stuff, we admire their business acumen. Those two gentlemen are very savvy marketers. The Lilly Warehouse sales will remain in KOP (King of Prussia, home to the Lilly Mothership). How will Oxford/Lilly react to customer concerns about quality, direction, and brand dilution? That is an unknown. Lilly Pulitzer has an extraordinarily passionate customer base, not quite on par with Apple (but close), with a devoted, almost-cult-like following. Consumers know prints by name, specific garments by cut and style: the Bowen dress, Paley Cardigan, McKims sandals, and recently, the wildly popular Murfee scarf, to name just a few of the items buyers covet. (Yes, we have a few favorites as well!) The Re-Lilly Facebook group has grown to more than 2700 fans in just one year, followers who buy, sell, swap and share Lilly merchandise, tips and tidbits. Some believe Lilly is no longer as “special” as it once was. Messrs. Bradbeer and Beaumont have done a stellar job bringing the brand back from the grave, to be sure. But recent collaborations have troubled some customers, the LeSportSac partnership seemed especially irksome to many, although it didn’t bother us. The company has licensed or partnered with firms making everything from electric cars to cosmetics to stationery. (Full disclosure: we are sellers of the Lilly Pulitzer Stationery & Gifts line.) The enormous Lilly Pulitzer Furniture Collection due out in the spring has sparked conversation as well. (More info and photos here.) One area greeting the news favorably: the stock market, Oxford shares were up 22% as of this writing. As Lilly’s executives noted on the conference call, they were not actively shopping the company, having declined previous approaches over the years. In this case conversations continued past the initial stage, and the offer transcended others in providing a solid “strategic and cultural fit,” according to Thomas Caldecot Chubb, III, Oxford’s president. As with any transaction of this magnitude many factors are unknown. From a selfish perspective, we do love our Lilly, although we don’t live in it, in part because of the climate – The Great Midwest doesn’t encourage summer fashions year round. Sigh. And we want to see the small, independent shops we love (hello Village Palm and many others!) continue to grow and thrive. So we’ll cross our fingers and our toes, hoping that good things happen going forward. More importantly, what do *you* think? We begin with an intriguing story from the far side of the pond, this one from the student newspaper at Oxford. Published Friday, “Sloanes versus Preppies: the rise of upper middle class cool” is just as it sounds, the piece examines similarities and disparities between the groups. For those not as familiar with Sloanes (originally Sloane Rangers), the term became popular in the 80’s. Princess Diana is frequently referenced as an example, there were also Sloane Ranger Handbooks, not unlike TOPH. This one is a fun read, if so inclined here is the full story. Last week we mentioned customers can now shop Last Call online; the Times story notes that Nordstrom Rack is also available online. We would caution anyone heading to the Rack online – the selection is fairly limited at this point, presumably it will be expanded as the days go by. Next, a few nautical notes we think our treasured readers may enjoy. The first is a line of sailcloth bags we weren’t familiar with from True Wind USA. The company’s bags are made in the USA, and they are super-durable. 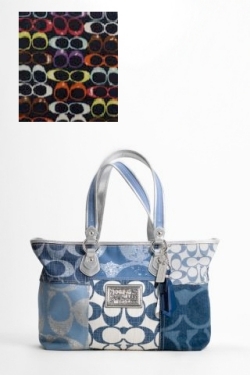 We like the Classic Tote Bags, but there is a great selection of sizes and styles. Next, with apologies to any of our Facebook Fans who may have seen our mention already, the nautically inclined chair from Halo Styles caught our eye. Keeping with the signal flags theme, Nautica is shooting next summer’s catalog, and sharing pictures as they go. Click here to see the photos on Twipic, or on the company’s FB page to take a peek at the upcoming styles. There has been all sorts of chatter about the upcoming Lilly Pulitzer Furniture Collection that launches in the spring (most recently we posted about it here and here); we wanted to let everyone know there are a number of additional places to see more photos. We close with today’s Pretty in Pink and Green.